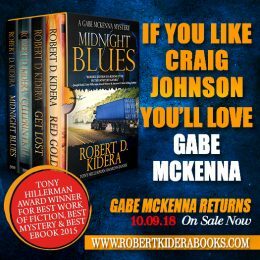 Hillerman Award Winning Author Robert Kidera is back with the next installment of the Gabe McKenna series, “Midnight Blues.” Fans of Craig Johnson will love Gabe McKenna. In this book Gabe must ask himself, just how high a price is he willing to pay to save the innocent? What kind of person would harm a child? I gnawed on that question all one-hundred and thirty-eight miles on the interstate from Albuquerque to the edge of Gallup, New Mexico. A headache climbed aboard at milepost forty-two. “Maybe, but three a.m. and me have never been friends.” A litany of his groans and carefully crafted grimaces filled the car. Onion’s not really that bad. In his own words, he’s a man of many interests. Booze. Broads. Burgers. He grabbed a flashlight out of the glove compartment, took the batteries out of its casing, put them back in, clicked it on and off, on and off. Then he leaned back in his seat. A silent breeze blew sand and dust against our windshield. I turned on the washer and wipers to improve my view. No cars on the road, no stars in the sky, and nobody else around. I crossed Old Route 66 in downtown Gallup and turned onto Vega Place. With half the streetlights burned out, and a cloud-covered, moonless sky above, we crept along at five miles per hour, straining to read the house numbers on a row of tired bungalows. No easy task on a night this dark. New Mexico’s newest private investigators, we were out on our first case—a frightened mother’s phone call about her missing son. We took some hesitant steps toward the front of the weathered cottage. Trumpet vines at the porch corners ran wild, engulfing the wooden posts. Their dragon-claw tentacles reached out, brushing my cheek, sap-sticky on my skin. I sucked in a breath deep enough to hurt. “You didn’t hear what I heard—a mother with her heart ripped out.” I rang the doorbell and stepped back. I rang again, and then a third time. Something clattered inside. The porch light flickered on. The door opened an inch, stuck for a moment, and then jolted open all the way with a high-pitched squeal. “He’s gone.” Estrella Chissie’s face showed pain times ten; her eyes were still small, lifeless and lost. But she’d had her broken tooth fixed, and her lips weren’t battered blue as they were the first time we’d met. She raised her hand like she was lifting an anchor. Then her body trembled, her eyes rolled out of sight behind her eyebrows, and she nosedived toward the floor. I caught her by one shoulder. She weighed less than my last dog. “Lemme give you a hand.” Onion grabbed Estrella’s other shoulder and together we dragged her inside to a dimly-lit living room and laid her on an old brocade couch by the front window. A second woman, no more than four-and-a-half feet tall, all curly brown hair and tan skin, burst into the room. “Estrella?” I heard a slight Hispanic accent, even in that single word. Onion and I stood there, fifth and sixth wheels, surrounded by a traffic jam of mismatched furniture that overwhelmed the room. The curtains were drawn, a single overhead light fought the darkness. The whole place smelled like a tomb. “Stay there, dear. Let me get you some water.” The short woman glanced over her shoulder like she noticed me for the first time. I looked to Onion for some guidance. He rubbed his nose. He checked the ceiling light. He shrugged. Thanks, pal. Onion and I propped her on the couch, then backed off and gave her space for the pain. She pointed at the woman who’d returned and now stood across the room, a glass of water in her hand. “This is Luna. My sister-in-law. She lives with us.” Estrella’s shoulders slumped, like even that little effort had exhausted her. But she did accept the water from Luna and took a sip. “Care for some coffee?” Luna looked my way and then at Onion. “That’s fine.” It had already been a long night and I had a three-hour drive back to Albuquerque ahead of me. Luna smoothed her apron and flashed us our first smile of the night. She turned and scuttled down the hall with the quick, rocking gait of a small dog. Estrella’s hands never stopped clasping and grasping each other, like she was trying to wash off some stubborn stain. She draped herself at an angle across the couch. Bits of stuffing peeked out next to her knee. The sofa’s dull, green fabric had worn away. An exposed spring nearly reached the floor beneath the nearest cushion. She swallowed a couple of deep breaths and closed her eyes before speaking again. “He’s gone…” Her voice was as quiet as an empty church, yet it held a startling note of acceptance I wasn’t expecting. “Tell us what happened. Why you called me. Leave nothing out.” I looked at Onion. He had his spiral notebook and pencil in hand. “Your son, right?” I nodded to prod her along. “Man or woman’s voice?” I watched her eyes. The truth is in the eyes. “I do not know, sir.” She stared at the ceiling, watery eyes unblinking. Waiting. She was staring at a clock above the fireplace when Luna returned with two cups of coffee, each set on a thin china plate. She served us like she’d apprenticed at a diner or two somewhere along the line. The brew was too hot to drink right away. I rested my cup on a small table to my left. Onion placed his on the mantle. “Thank you, ma’am.” A couple of weeks out west and he’d picked up a twang. “I write this down. Permiso por favor.” She reached inside her shirtsleeve and pulled out a crumpled piece of paper, then read it in a soft monotone, “I must bring the money to Red Rock State Park at nine o’clock—that would be tonight. Thursday. Take the Church Rock Trail to a sandstone wall. The wall with foothold grooves in it. He say meet at the base of that wall and give him the money for Jay-Jay.” She handed me her note. Estrella’s eyes glowed with a sudden fire. “I no care. I want my son back. I do whatever he say. I no care what happens to me.” Luna sat at Estrella’s side and wrapped an arm around her. She mewed and cooed. Estrella whimpered. Neither of them spoke. Onion shrugged and put his coffee cup back on the serving table in front of him. He gave me a slight nod, like the next line was mine. “Excuse us for a few minutes, would you? I need to speak with my partner.” I motioned toward the door and Onion followed me outside. The porch light was still on. A couple of moths danced about our heads. A cricket chirped a sad lament from somewhere under the porch. 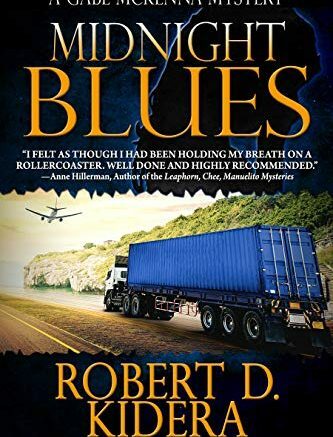 Be the first to comment on "Special Excerpt “Midnight Blues” by Robert Kidera"